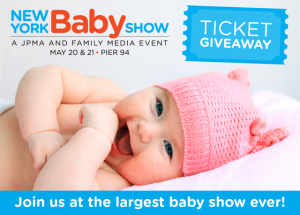 New York Baby Show – TICKET GIVEAWAY! The 2017 New York Baby Show, on May 20 & 21 at Pier 94 will once again be the largest show for new and expectant parents in the country. Now in its 7th year, no other event provides a better experience for thousands of expectant and new families from New York and neighboring counties, seeking a family-friendly jamboree of top brands, great speakers and seminars, big giveaways, and lots of learning, support, bonding, and fun as you make your way into parenthood. We are giving away tickets for you and your family to experience the show. Normal ticket price is $30 per family (for 2 adults and up to 4 children), and $20 per individual. Now, you may be wondering why I’d be going to such an event, or why I’m giving away tickets. Well, back in December, Hubba Hubby and I received some wonderful news! His sister is pregnant!! …and SO ARE WE, which is why my fitness routine has had to change a ton since last year. But that’s a different type of post, and you’ll read more about that next week! We’re super excited over the moon about this, though I’m still coming to terms with sharing this type of news with the world (I feel very protective, Mama-Grizzly towards Baby!). If you have any advice on the type of gear you used for your baby (crib, stroller, high chair, car seat, everything!! ), we are all ears as there is so much stuff out there that we are overwhelmed and need help picking out what’s best for our first child!!! Let me know in comments if you’re coming to the show and/or if you’d like to say hi — I love putting faces to my readers’ names! Usual restrictions apply – contest not open to members of my actual family. Travel costs not included. Good luck! When I saw this post my first thought was you were having a baby. More congrats your way! Wow! So many life changes for you in the last year. I think it is just fantastic. I do not have children so I have absolutely no advice to give except to say that I hope you and hubby enjoy every single second. Thanks, S! We are enjoying every single second thusfar, so your hopes are coming true 🙂 All your well-wishes are very much appreciated. Yvo!! My heart is full!! So happy for all of your wonderful news!! I 100% assumed this was an April Fools joke but I guess not! I also did more research on baby stuff than any human being should so I will happily share anything you want to know. Also, I am volunteering/working with one of my favorite Babywearing Brands (Cassiope Woven) and will be at this show! See ya there!